Come to Combat Doors to order a set of the finest Aluminium Bi fold Doors in Manchester and we can guarantee that you won’t be disappointed. Just a quick glance at the testimonials provided by previously satisfied customers will be enough to reassure that, when it comes to purchasing bi folding doors in the North West, you’re in the safest hands possible. You don’t have to take our word for it, however, or even the word of those people already enjoying the many benefits of bi folding doors. Download our brochure, pour yourself a cup of tea and spend a while exploring everything our aluminium bi fold doors have to offer, before contacting us for a free quote and discovering that, when it comes to Combat doors, quality and value go hand in hand. Value for money and a guarantee of hard-wearing quality being just two. Our bi fold doors also provide a stunning mix of style and substance, of a practicality and aesthetic appeal and of security and versatility. The fact that every set of bi fold doors is individually designed and created bespoke for each customer means that no two sets are alike and that each set sits in perfect harmony with its surroundings. In other words, select bi folding doors in Manchester and you’ll be choosing a product which fits perfectly within your home at the same time as transforming it. For an insight into the impact which a set of aluminium bi fold doors can have, simply imagine a window running from floor to ceiling along the entire length of a wall. 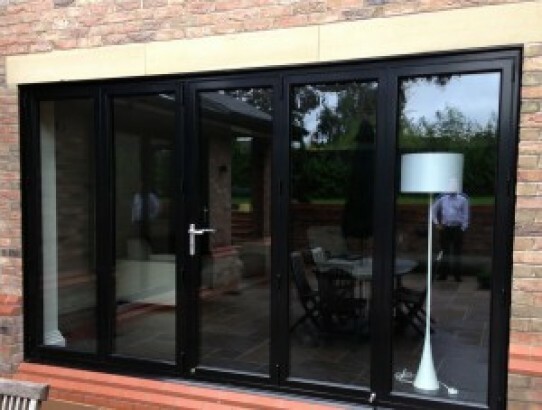 The glass allows the room to be flooded with light whilst keeping out the unwanted elements. The stylish, slimline aluminium frames do nothing to break up the view whilst offering security and stability, and the fact that the ‘wall’ in question can be opened up fully whilst folding in on itself. Meaning that the boundaries between home and garden can be dispensed with entirely whenever the mood takes you. Whilst installing a set of bi folding doors, whether in the North West or beyond, may seem like a big step to take – and will indeed have a revolutionary impact upon your living space – there are two factors which help to keep it simple and manageable. The first is the sheer professionalism of the people we employ; a level of skill which allows them to fit a set of bi fold doors of any size whilst keeping disruption to the absolute minimum. The second factor which allows people to actively enjoy the process of choosing and installing aluminium bi fold doors is the sheer fun to be had in selecting each and every detail. At Combat Doors the customer is in charge, selecting the layout of the individual doors, the style and colour of the frame – whether one colour or two – and details such as the handles and beading. The final product will be something you can take as much pride in as we do – a set of bi folding doors that blur the boundaries between indoors and outdoors, expand the space in which you can work, rest or play and offer a stunning focal point for your home that’s built to last for many years to come.